A strain is a tear in tendon fibers resulting from overstretching, while a sprain is an equivalent injury to a ligament. Strains and sprains can happen to anyone, but athletes are at higher risk. P.R.I.C.E. is a treatment method for muscular strain: protection, rest, ice, compression, elevation. Cold compression therapy uses ice packs and wrapping to reduce swelling and inflammation to encourage the healing process. strain: An injury to a muscle or tendon in which the muscle fibers tear as a result of overstretching. sprain: To weaken a ligament by sudden and excessive exertion, as by wrenching; to overstrain, or stretch injuriously, but without luxation; as, to sprain one’s ankle. Gymnasts frequently suffer from mild ankle sprains. Cold compression therapy is the recommended treatment. As soon as possible, the gymnast needs to begin to take brief walks as part of rehabilitative therapy. Failure to rehabilitate the ankle can permanently weaken it. A strain is an injury to a muscle or tendon in which the muscle fibers tear as a result of overstretching. A strain is also colloquially known as a pulled muscle. The equivalent injury to a ligament is a sprain. Typical symptoms of a strain include: localized pain, stiffness, discoloration, and bruising around the strained muscle. Strains can happen while doing everyday tasks and are not restricted to athletes. Nevertheless, people who play sports are more at risk of developing a strain due to increased muscle use. 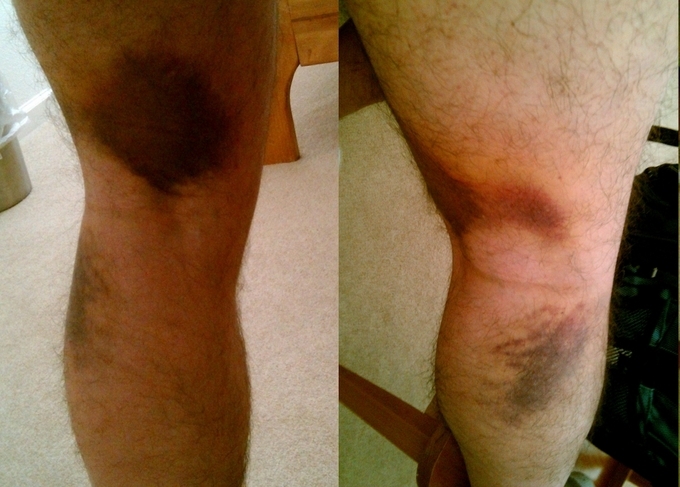 Muscle Strain: Pulled hamstring after four days. Two images of the same leg. One of the pictures was taken in a mirror. The first-line treatment for a muscular strain in the acute phase includes five steps commonly known as P.R.I.C.E. Rest: Don’t use the injured limb. Ice: Apply ice to reduce swelling by reducing blood flow to the injury site. Never ice for more than 20 minutes at a time. Compression: Wrap the strained area to reduce swelling with an ACE soft-wrapped bandage. Elevation: Keep the strained area as close to the level of the heart as is conveniently possible to keep blood from pooling in the injured area. The ice and compression (cold compression therapy) will stop the pain and swelling while the injury starts to heal itself. Controlling the inflammation is critical to the healing process and the icing further restricts fluid leaking into the injured area as well as controlling pain. This immediate treatment is usually accompanied by the use of non-steroidal anti-inflammatory drugs (e.g., ibuprofen), which both reduce the immediate inflammation and relieve pain. However, NSAIDs, including aspirin and ibuprofen, affect platelet function (this is why they are known as “blood thinners”) and should not be taken during the period when tissue is bleeding because they will tend to increase blood flow and inhibit clotting. After the bleeding has stopped, NSAIDs can be used with some effectiveness to reduce inflammation and pain. It is recommended that the injured person should consult a medical provider if the injury is accompanied by severe pain, if the limb cannot be used, or if there is noticeable tenderness over an isolated spot. These can be signs of a broken or fractured bone, a sprain, or a complete muscle tear.